How're your reflexes? How's your perception? If they're both highly tuned, then you'll do well at Snaggit, a new card game that's available from Yay Games. Playres must grab the right cards from the center of the table, but only grab the ones they need. Everyone's going to be trying to get the best ones, so you have to be quick. 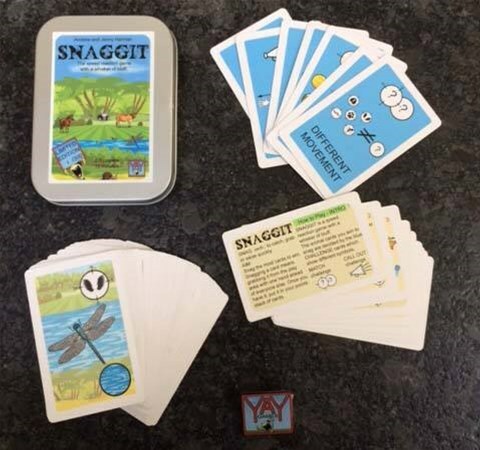 SNAGGIT is available now in a Limited Edition of 300 in a tin with a free YAY Games Badge. It was launched on the 6th April at UNCON 5.0 in Broadstairs in Kent. 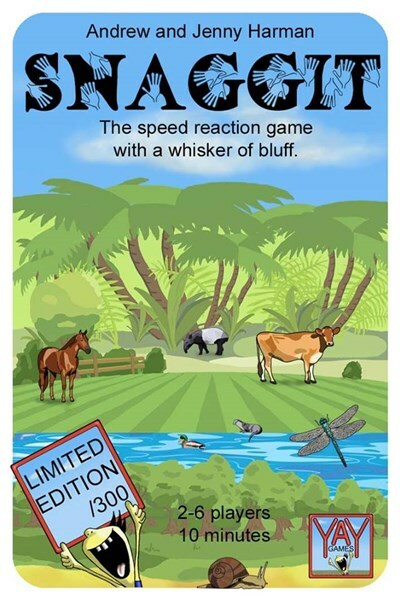 SNAGGIT is quick, delightfully simple and brings a new angle to speed reaction games. Each round 6 cards are placed in a circle and using one hand, you have to snag as many cards as you can that fit the current challenge. This can be matching the habitat or movement of the animal card, or not. Or in a 'call out' challenge you have to snag an animal and declare what about it is the 'biggest', 'quickest' or 'strongest'. But get it wrong and you lose that card and another from your hand. Fast, funny and very silly, SNAGGIT is the fifth YAY Game!